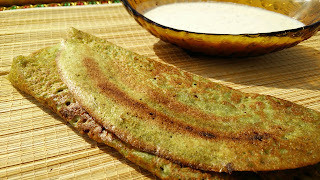 Palak dosa or spinach dosa is a delicious and healthy dosa recipe usually served as Indian breakfast. The mixture of all kinds of dals or lentils along with spinach makes it very healthy. 1. Soak all lentils/dals for 6-7 hours. Rice should be soaked separately for 2-3 hours. Once the dals has puffed up well, make a paste by adding all these ingredients along with salt and ginger in mixer jar. The paste should be smooth and little thin. Add water to adjust the consistency. 2. For coconut chutney – add coconut in grinding jar to make a thick chuntey. Splutter mustard seeds and curry leaves and top it on chutney. Adjust the consistency of chutney by adding curd. 3. On a non stick pan or griddle, apply little oil to grease it. Pout a ladder full of dosa batter and spread it in circular motion to form a thin layer of dosa. Apply little oil on sides and center. Let dos cook for 2-3 min and once cooker flip over. Cook for another 2 min. 4. 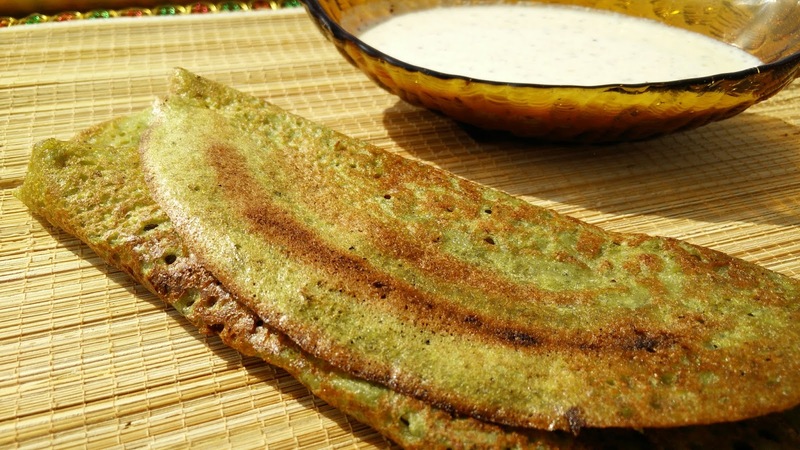 Serve hot spinach dosa with coconut chuntey.